Michael Builta, 52, of Bloomington, passed away at 9:38 a.m. Monday, April 8, 2019 at OSF HealthCare St. Joseph Medical Center, Bloomington. His funeral will be at 10 a.m. Friday, April 12, 2019 at St. Patrick Church of Merna, Bloomington, with Rev. Dustin Schultz officiating. Burial will be in Dawson Cemetery, Ellsworth. Visitation will be from 4-7 p.m. Thursday, April 11, 2019 at Carmody-Flynn Funeral Home, Bloomington. In lieu of flowers, memorials may be made to the Growmark Foundation or to St. Patrick Church of Merna. He was born December 12, 1966 in Chicago, a son of Darwin and Rebecca Mullen Builta. He married Sheila R. Strowmatt on January 6, 1996 and she survives in Bloomington. Also surviving are two daughters, Haley Builta and Kelsey Builta; his parents, Darwin and Becky Builta of Mahomet; two sisters, Cheryl (Todd) Sommer of Foosland and Kathleen (Phil) Reed of Pelham, NY; his grandmother, Maude Mullen of Chillicothe; his parents-in-law, Larry and Judy Strowmatt of Roodhouse; and a sister-in-law, Sheri (Steve) Goodall of Roodhouse. He was preceded in death by his paternal grandparents, Delmar and Eleanor Builta; and his maternal grandfather, James Mullen. Mike graduated from the University of Illinois with a Bachelor’s degree in Agricultural Economics with a marketing specialty and a Master’s degree in Crop Science. He was formerly employed in sales administration roles for non-System seed companies, general manager for the Christian County Farmers Supply in Taylorville, and former general manager for GRAINCO FS in Ottawa, as well as being involved in the family farming operation. 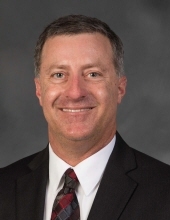 Mike was currently the Vice President of Energy and Logistics for Growmark. An avid outdoorsman, he especially enjoyed hunting and hiking as well as boating. Mike was a loving and devoted husband, father, son and brother who would do anything for his family. 1001 N. Towanda Barnes Rd. "Email Address" would like to share the life celebration of Michael Builta. Click on the "link" to go to share a favorite memory or leave a condolence message for the family.